⚓ T82996 Config property 'magazineGroup' has no effect. Config property 'magazineGroup' has no effect. The new 'magazineGroup' property introduced in 1.42 does not seem to work. Magazines added only via the magazineGroup will not work in the gun. Compile the Sample "Test_Weapon_01" and load it. The weapon will only accept tracer magazines (added directly to it's Magazines array). The 'non tracer' magazine that should be added via magazineGroup does not work in the gun. ImperialAlex set Category to Config. ImperialAlex set Reproducibility to Always. ImperialAlex set Severity to None. ImperialAlex set Resolution to Open. Please note magazineGroup config attribute is documented in https://community.bistudio.com/wiki/Arma_3_Weapon_Config_Guidelines - as such I believe this issue should be given more attention. Lack of common magazine interface is rather serious limitation of 3rd party mods. 'magazineGroup' not work ar all. And BI self not used in ARMA3 config ! I want to use 'magazineGroup' so much ! If you try to drag a incompatible magazine into the weapon ammo slot in inventory it is red. For a magazineGroup magazine the slot is white. but when you drop the magazine onto it nothing happens. addPrimaryWeaponItem works just fine. The magazine is in there and you can shoot fine. If you take the weapon out and drop it into inventory you get the mouse wheel menu option to reload it again. It loads just fine and you can shoot again. But you can only load the magazine you last used via mouse wheel menu. Or any non-magazineGroup compatible magazines. So I take drop the magazineGroup mag into inventory. 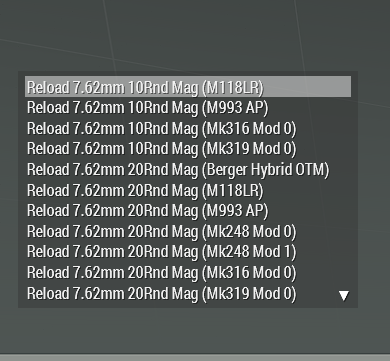 I can now reload the magGroup and the normal magazine via mouse wheel menu. But if I load the normal one the magGroup one disappears from mouse wheel menu. The inventory knows it's compatible and the weapon knows it's compatible.